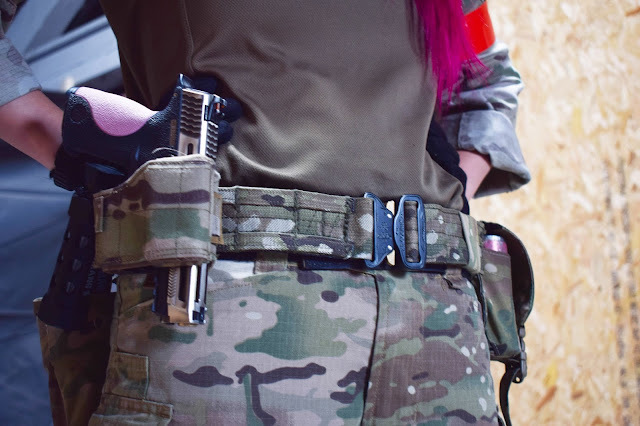 FRV TAILORING MULTICAM COBRA SHOOTERS BELT REVIEW! Welcome back to the blog! Today I have another review for you, this time on the FRV Tailoring MultiCam Cobra Shooters Belt! Whilst I was at Tora Bora Raid hosted by PAST at The Rock on the Isle of Dorset I was introduced to a gentleman called John, who is the owner and maker behind a tactical kit company called FRV Tailoring based in Aldershot, Hampshire. John had brought with him a selection of belts and I was lucky enough to get one in MultiCam to test drive! So the Cobra Shooters Belt is a low profile, lightweight and affordable alternative to some of the pricier shooters belts on the market. It has an inner belt made of one layer of webbing with velcro hook on the outside which you feed through your trouser belt loops as you would any normal belt, then you place your outer belt with all your pouches, holsters etc attached over the inner belt and fasten it with the cobra buckle. The belt is 50mm/2" in width with 18 columns of molle. The molle loops run along the top and bottom of the outer belt and they're compatible with any molle or pal attachable pouches and holsters. The outer belt has a double layer of webbing to give it that rigidity and it has a cobra buckle that is rated up to 4000 lb's. On my belt I have transferred most of the pouches and my universal holster from my WAS PLB battle belt - including two Grey Ghost Gear 40mm pouches, one Mille Gear Kraken Kydex 40mm TRMR Holster, a dump pouch and my universal pistol holster. The belt has plenty of room for all my kit and isn't weighed down by it. The pouches are really secure too and don't bounce up and down too much! At a later date I'll be adding my pistol mag pouches! How does it fit? Well, when I came back from the States I realised I had put on a lot of 'comfort weight' and made an effort to change that with more exercise and cleaning up my diet, I am now back to my 2016 weight which I am over the moon with but this has resulted in my previous battle belt - the WAS PLB belt rubbing my hips sore despite the padded inner because of this weight loss, hence my search for a better fitting belt. The FRV cobra shooters belt is lighter, thinner and because of this it sits on my hips firmly but doesn't rub. It's comfortable to wear even during long ops such as Tora Bora Raid! The belts are sized to the users waist size. Although I have a 28" waist it is more comfortable for me to wear belts on my hips so I opted for the 32-34 which also allows a little room for warm clothing layers that I'll no doubt be wearing as the British Summertime comes to an end. What's the cost? The belt retails at £69.99 which is super affordable compared to similar belts on the market, giving airsofters that high end look and handmade quality for less! 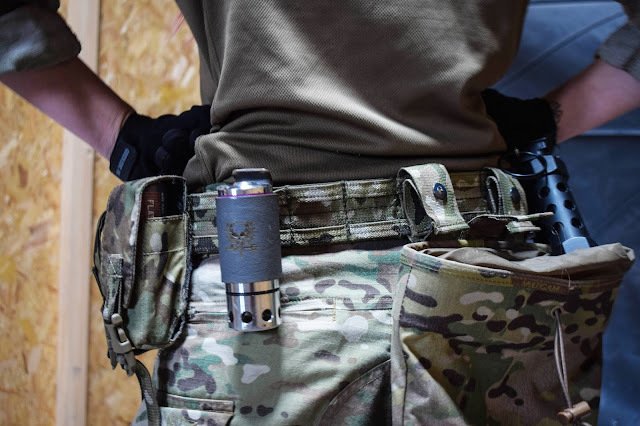 Overall, I REALLY like the Cobra Shooters Belt from FRV - it's a lightweight, low profile, affordable option for airsofters. It is comfortable to wear, doesn't rub my hips and has room for all my pouches/holsters, what more could you need? You can find the FRV Tailoring shop here or check out their Facebook page here! 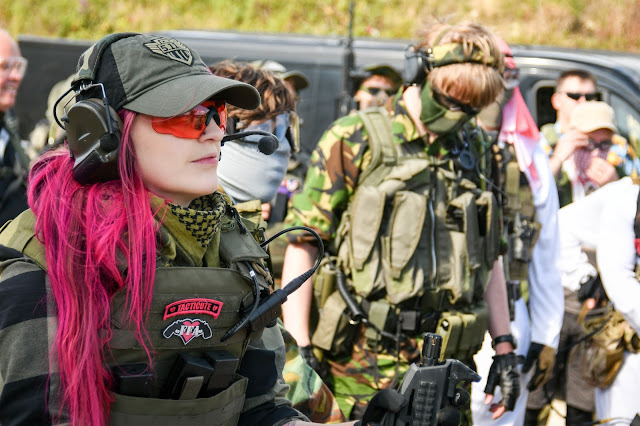 Femme Fatale Airsoft's followers can also get 10% off their orders by using the code 'femmefatale' at the check out! Patrons: Oskar Engstrom, Owen Walker & James Smith.